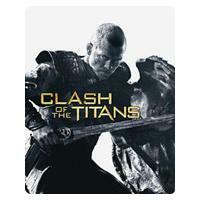 Clash of the Titans - Premium .. I've seen a lot of bad reviews of the movie but after watching it myself with a low expectation it turned out to not be as awful as I've read. If you're expecting a great story telling live action remake of the previous 80's version than yes there is going to be some disappointment but if you keep the feeling of expectation to a middle than you'll be more entertained than you'd expect. Unlike the 80's version this one gives more stor..
***SPOILER ALERT***The film opens with a quick briefing on events that have happened long ago. Earth used to be ruled by those known as the titans. That is, until Zeus (Liam Neeson) and his brother Hades (Ralph Fiennes) conspired to overthrow them with a creature known as the kraken. Zeus then created mankind, whose prayers feed the gods' immortality, but one group of men, led by King Acrisius (Jason Flemyng), grew tired of the gods' w..